I’m getting so excited for the big reveal! If you didn’t hear last week, I was asked by Michaels to be a part of their Holiday Dream Tree Challenge. A beautiful pre-lit Christmas tree was shipped to my front door along with a fabulous Michaels gift card– and the rest was up to me! So fun, right?! Here’s another sneak peek at what we’ve been up to around KPI. 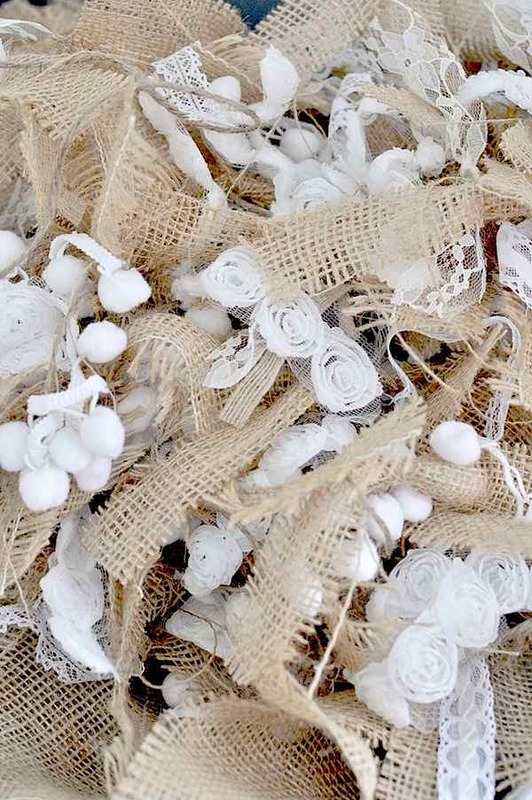 This picture shows part of a lovely burlap & lace garland that we made for the tree. All of the decorations and ornaments on my tree were made with supplies from Michaels. Michaels even has four different holiday collections this year, making your tree decorating all the more easier! Check out these videos of the holiday collections- Jingle & Jolly, Cedar Lodge, Frankincense and Crystal Elegance. Come back tomorrow to see the final reveal of my tree! You will also be able to see my tree, along with other trees that have been decorated by creative bloggers on Michaels’ Facebook Page, Pinterest Boards, Twitter and YouTube. Can’t wait to see it!!! What an awesome opportunity for you!